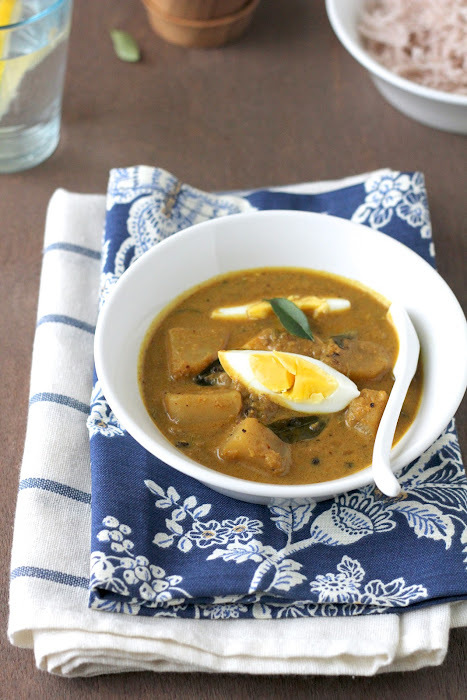 This egg n potato curry makes such an awesome gravy with the flavors of both egg n potato and all the spices in it. This is a very easy recipe which goes well with Appam , chapati or even rice. Its an instant hit in my nest, especially on a very lazy day :) Njoy it !!!! Clean , peel and cube potatoes.Put it in a bowl with cold water so that it wont change the color. Heat oil in a pan and add cumin seeds.Toss it for a couple of seconds and then add bay leaves and curry leaves. Add Chopped onion and saute till they turn golden brown , for 8-10 minutes. Crush all the ingredients in Bowl 1 , add to the pan and saute till the raw smell disappears. Sprinkle some water in between to prevent it from sticking to the bottom of the pan. and stir in to the pan. Saute for 1-2 minutes and then add cubed potatoes and salt to taste. Combine well, so that the masala gets mixed well with the potatoes. Uncover and add crushed cardamoms , black pepper and garam masala. Delicious curry with the combination of egg and potatoes and the aromatic spices! Wow! Lovely combo!! Delicious gravy!!! blog's new look is nice! Delicious gravy, great combo..love this curry with chapatis..
Curry looks so yummy in that beautiful dish. yummy gravy & nice clicks!! Egg and potato sound wonderful in a good curry gravy. I'll have to try this one! Yummy looking Egg curry. Ideal with plain rice. yummmmmmmmmmmmm combo and very tempting and mouth watering. nevr tried this version of egg curry but it looks like my most fav dish from a local restaurant. gonna try soon. Egg and potato curry looks really good. I love eggs & this looks very tempting...Nice click. BTW, these days ur pics are just SUPERB. So what u do to get so much of light?...Is it the way u take it, or did u get a new camera? U r acurry queen....i so badly wanna try some of ur dishes out. this looks delicious..nice pic too ! Sarah.. curry looks yummy.. Never tried this combo.. Egg Curry looks so good...Well said it is a perfect recipe for a lazy day no need for side dish when served with rice.. The egg curry looks delectable! Yummmy combo..lovely dish goes awesome with rotis and rice..
Adipoli! The curry looks great. 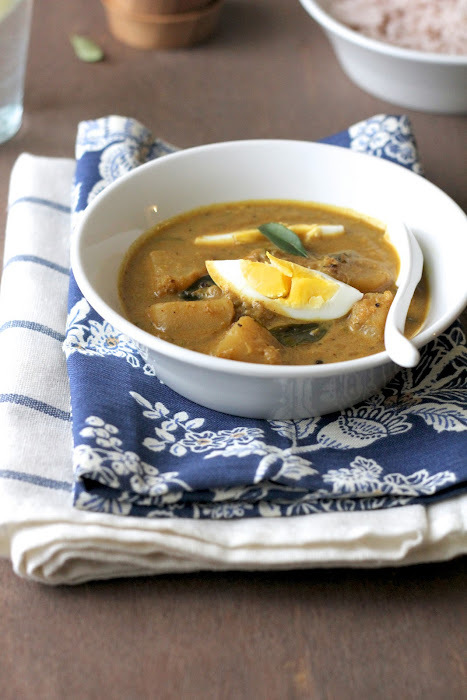 I love this egg curry with appoms, was my favourite when i was living at home. I have never tried egg with potato..looks fabulous.Thanks for sharing!! what a delicious looking egg curry...very simple yet satisfying...yummie! Egg curry is my all time fav....looks spicy and delicious!!! love the curry! spicy, yummy! Haven't tried cooking egg in curry before but this recipe sound interesting! Egg & potato.great combo.Chapati de koode adipoli ayirikum..yummyyy..
Nice egg curry but I love to cook this curry sans potatoes. I will be happy without meat with a meal like this! Great combo, love try this recipe!! BTW I tried your Chilly Egg, me and my DH loved it :)) Thanks for sharing!! Curry looks awesome..nice new look and great click..
sarah, tried this potato-egg curry..loved it with chapathi.. I tried this out but it didn't come out well. I will have to say that whenever I try your non veg recipies from your site, it lacks enough spices. I have tried many of your recipies and all your veggie stuff comes out well but for all the non veg stuff, I have to add so much of extra masalas. I wonder if you use the exact tsp n tbspn measure when you try these. Anon , as in Anon , anon? So sorry to hear that.. and to be honest this is the first time , i am hearing my recipes lack spices. usually people say my recipes are spicy. may be you are on the other edge ...if you are talking about heat as in chili powder , thats a different ball game ... and thank you for saying my veg recipes came out good...I was always appreciated for my non veg dishes. The only solution I can tell you is , as i always say " use spices as per your liking ;)"...Dont you think , i cant cater to everybody's spice needs ..After all , I post here , what i make right?. Great to hear u loved it :)...Thanks much !